Will the West Ealing CPZ be bad for business? Monday saw the start of the month long work to implement the West Ealing CPZ. The first white lines were marked out in Coldershaw Road. However, there is some concern that local traders may lose out because the plans include switching some 19 stop and shop bays along Coldershaw Rd, Canberra Rd and Leeland Terrace to shared use. The stop and shop bays will be confined to Leeland Rd and the car parking behind and beside the library. On the face of it this seems to mean fewer short-term bays (usually 30 minutes) for people coming to shop in West Ealing as these 19 bays could be used by long and short stay visitors as well as permit holders. Will this change from stop and shop to shared use affect local businesses? Will shoppers not bother trying to park in West Ealing and take their trade elsewhere? The Hindu Temple in Chapel Road ( Shri Kanaga Thurkkai Amman) has submitted an application to Ealing Council to construct a permanent building to replace the existing marquee on its site. The new building would have a basement, ground and first floor and one of its functions would be as a meditation hall. The temple is well known locally for its hugely popular and colourful annual Chariot Festival each August. What is of concern to some local residents is the impact on parking and congestion in what is already a highly congested area. Chapel Road is a very narrow street and is frequently heavily parked up with worshippers at this busy temple. If you live nearby do please take a look at the Council’s website for more information about these plans. Hopefully this link will take you to the planning search page and the reference number is 177615FUL. The Ealing Dean Residents’ Association is opposing these plans. Following local residents’ concerns about the problems caused by all the pigeons on this patch of grass, the Council has put forward an initial plan for redesigning this grass area on the corner of Melbourne Ave and Leeland Terrace. 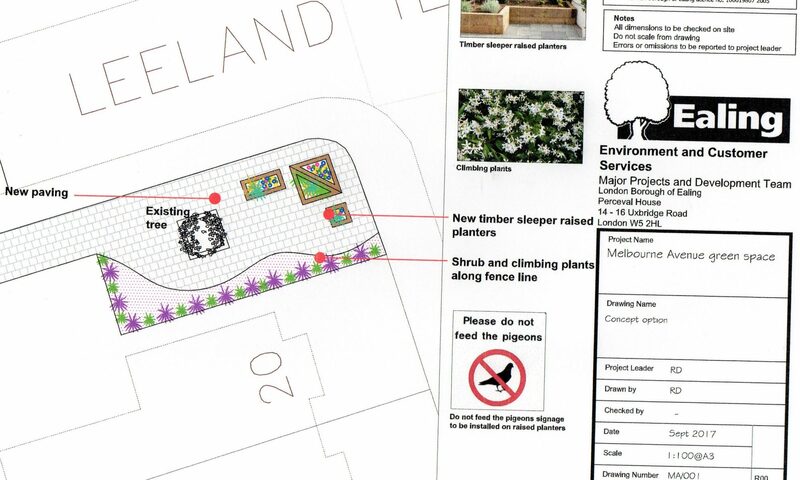 It’s worth knowing that part of the design will be to include permanent notices asking people not to feed the pigeons. 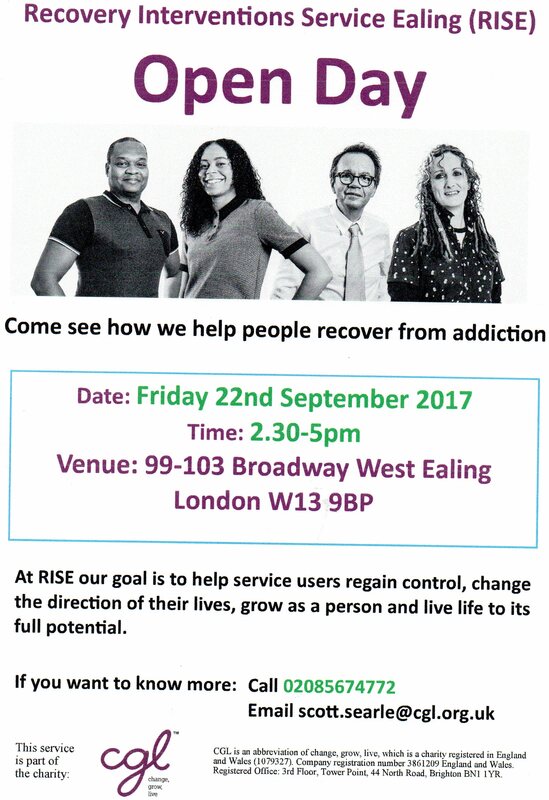 They are looking for feedback from residents so your comments are welcome. My initial reaction is that there is too much open space and it needs more plants but others may think differently. You can email your comments to us at westealingneighbours@gmail.com or leave them here. A big thanks to Dean from Jeff’s Flower stall. Dean spent Sunday morning cleaning out all the rubbish from the circular planter/bench by his stall at the top of Melbourne Ave. It was full of discarded cans, food wrappers and more and looked very sorry for itself. 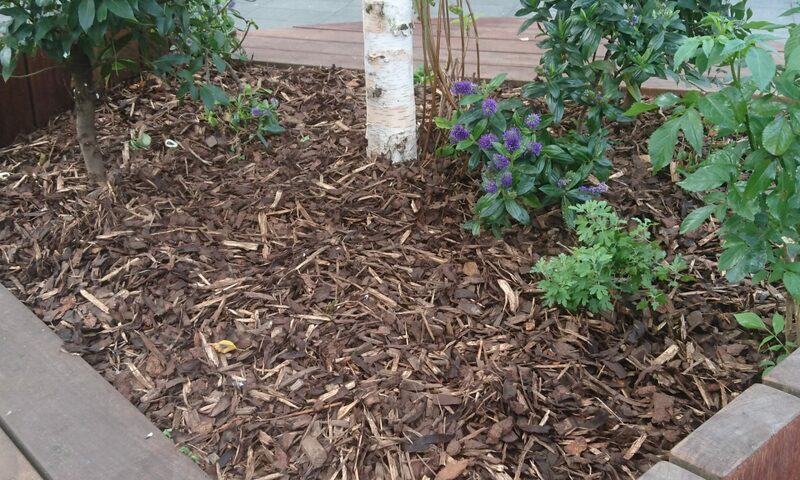 It’s been transformed with a some hard work and bags of bark (WEN paid for the bark) and now looks much better and so much more pleasant for the many, many people who sit there throughout the day. Our aim is to work with the Council to revive all the planting in the benches in Melbourne Ave in time for our Christmas Fair on Saturday 9th December. 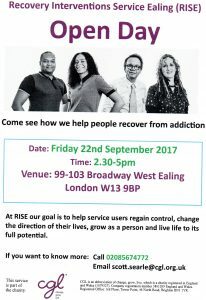 We may need some help from the community to do this. We’ll let you know more as soon as we can. ‘If you would like to see a world-class artistic programme, a community hub like no other in West London and an independently run social enterprise investing back into the community, please join our campaign for a World Class Watermans and share your support and comments. The Council wants to hear your views in support of a bid for funds from TfL’s Liveable Neighbourhoods scheme. The scheme is about delivering attractive and healthy neighbourhoods for residents -in this case residents of West Ealing. 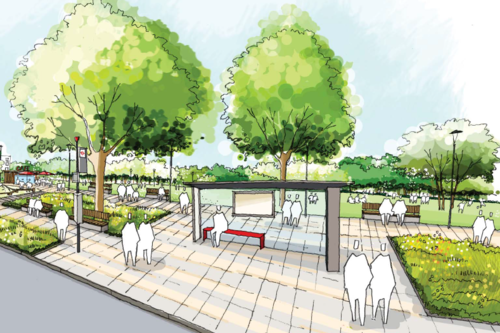 It includes improving conditions for walking, cycling and leisure with the aim of improving local air quality and the social and economic vitality of West Ealing. 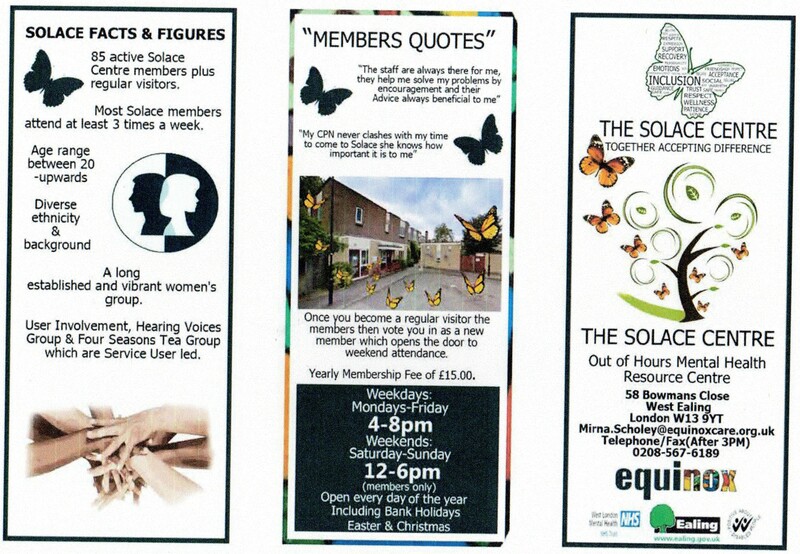 The Solace Centre is Ealing’s only drop-in centre for people who have experienced mental ill health. 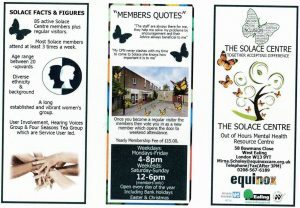 It is now in purpose built premises in Bowman’s Close. It is well worth knowing this facility exists and all credit to its users, the Council and others who decided to re-build it rather than close it.